Vitamin C (ascorbic acid) is often associated with fighting the cold, but there’s more to it than strengthening the body’s immune system. As a potent antioxidant, vitamin C helps neutralize free radicals that would otherwise damage the cells and the DNA, resulting to diseases. In anti aging circles, vitamin C is central to the formation of collagen: Without it, you’ll develop wrinkles faster, you can’t grow new skin, and your body would literally fall apart. Before vitamin C became popular as a skin rejuvenation treatment, it was the vitamin prescribed to sailors on long voyages. From the 15th century onwards, sailors would die from scurvy (a disease caused by a deficiency of vitamin C) because fresh fruits and vegetables could not be kept for long in ships. Even 13th century Crusaders were not spared. Today, scurvy can easily be treated by supplementation of up to 1000mg of vitamin C a day for a week, or 5 daily servings of fresh fruits and veggies. Thanks to advances in research, vitamin C has become prominent in the fight not just against aging skin but, more crucial, against cancer. While FDA hasn’t approved it yet for cancer treatment, very high doses of vitamin C is often administered to a patient through intravenous means to help radiation and chemotherapy work better. The result is a slow-down in the growth and spread of cancer cells. Apart from poor diet, insufficient vitamin C can also come from excessive exposure to sunlight. This is because the body uses up its store of vitamin C to combat the effects of UV photodamage, the same reason why it is used as an ingredient for fine lines treatment. The same can be said of smokers and others who are regularly exposed to second-hand smoke and other pollutants: Because vitamin C works doubly harder to eliminate free radicals, these individuals need more vitamin C than the rest (and a topical dose of vitamin C for smoker line treatment). Vitamin C has also been shown to help make hormones vital to the normal functioning of the nervous system. These hormones are dopamine (the feel good hormone), serotonin (the sleep hormone), and epinephrine (the fight-or-flight hormone), among others. So the next time you encounter brain fog, it may not just be from lack of sleep. The good news is, it doesn’t take much to achieve the recommended daily intake of vitamin C. Men should get 90mg of it every day, while women only need 75mg unless they are pregnant or breastfeeding. 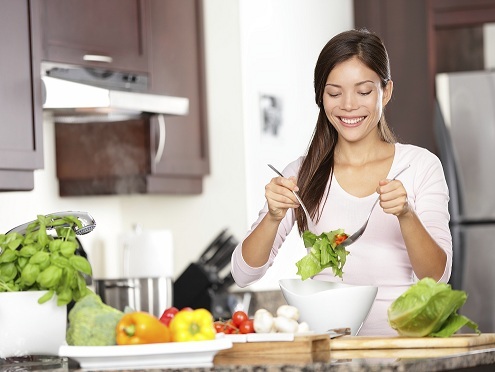 A variety of colorful fruits and vegetables every day should satisfy your body’s need of vitamin C; otherwise, inexpensive supplementation in ascorbic acid form is available. Too much of it – more than 2,000mg of vitamin C a day – and the kidneys will just eliminate the excess. Because of its central role in collagen formation, a skin care specialist would typically advise intake of vitamin C not just in dietary form but in topical form as well: not a lot of dietary vitamin C gets to the skin, as it has to feed the needs of other organs first before it gets to the dermal layer. This opens up the need for topical vitamin C, which can easily pass through the stratum corneum (the topmost layer of the epidermis) if the topical preparation has a pH below 4.0. 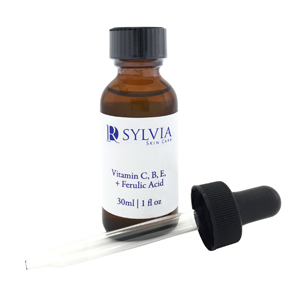 Dr. Sylvia’s Vitamin C, B, E with Ferulic Acid has a pH of 3.2, and works best for normal, oily and sensitive skin. This skin care treatment has been developed by Dr. Sylvia Ramirez, a leading anti-aging specialist in Singapore who offers evidence-based clear skin programs for healthy and young-looking skin. How Does Vitamin C, B, E with Ferulic Acid Work? Because topical ascorbic acid is vulnerable to the elements, it needs to be stabilized by other antioxidant compounds like the plant-derived ferulic acid that also works synergistically with vitamin C to enhance its antioxidant potency. Vitamin C’s photoprotection capabilities are also improved by the addition of vitamin E, which is another nutrient essential to skin health. The addition of vitamin B, particularly B3, enhances the skin whitening properties of vitamin C, while B5 boosts the collagen regeneration results of vitamin C, making the serum an ideal collagen treatment for mature skin. Together, their synergistic effects work to fight oxidative stress on many levels and for a deeper, more satisfying antioxidant treatment than any one of the vitamins alone.